"Towards the end of December 1941 a number of special landing strips had been constructed to relieve the congestion that would obviously arise in the event of a withdrawal to the island, and to provide dispersion for the Hurricane fighters. The plan had been to construct two strips in southern Johore and five on Singapore Island. Priority for labour had been given to Air Headquarters for this purpose, but the constant air raids caused civilian labourers to desert. By the end of January only two strips had been completed though others were in the course of preparation. Their existence, whether completed or not, provided the enemy with possible landing grounds for airborne troops - a threat which could have been countered only by detailing special detachments to guard them. Since no troops could be spared for this purpose all five strips on the island had to be made unfit for use. In addition all other open spaces which might possibly be used as temporary landing grounds were covered by obstructions." The move to upsize Tengah Airbase, ahead of the closure of Paya Lebar Air Base (PLAB) from 2030, demonstrates the importance of air power to Singapore’s defence because a substantial tract of land has been entrusted to the Singapore Ministry of Defence (MINDEF) and the Singapore Armed Forces (SAF). One can imagine that the MINDEF/SAF strategy is to maximise the Republic of Singapore Air Force’s (RSAF) ability to generate and sustain air power by adding as many military runways as we can onto our land-scarce island. Augmented by public roads that can be converted into Alternate Runways, having more runways would frustrate attempts at crippling our air force as hostile forces would be faced with a larger number of runways to deal with. It is all a numbers game. Runways are fixed assets whose locations can be pinpointed by GPS. But the existence of more locations from which the RSAF can launch and recover warplanes means that an adversary would likely require a sizeable number of satellite-guided munitions to knock out runways effectively. This is because fighter jets can take to the skies by using a fraction of a runway’s total length. As for combat and transport helicopters, these rotary-wing assets have practised operating out-of-base from locations such as golf courses. Aerial sights: Royal Air Force aerial reconnaissance photograph showing Kallang airfield (bottom left) and Paya Lebar landing ground (top right), which was constructed by the British as an alternate runway. The landing ground sits on the present location of Paya Lebar Air Base. British military planners who surveyed Singapore Island to identify possible locations for Royal Air Force airfields did such a thorough job that the three of the four sites are still used by military/commercial aviation today. 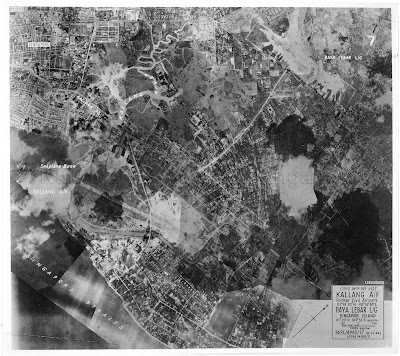 Even with four military airfields - Tengah in the west, Seletar in the north doubling as a seaplane base (then the largest east of Suez), Sembawang close to the Royal Navy dockyards and Kallang in the south (also a seaplane base) - the RAF was keenly aware of the vulnerability of its runways to artillery barrages and aerial attacks. As the Japanese closed in on Singapore from the north, belated efforts were made to construct as many as five landing grounds on Singapore to serve as alternate runways. Two more were planned in Johor Bahru. According to the British official history of WW2, only two landing grounds (LGs) were completed just prior to the invasion of Singapore. While the LGs are not named, Senang Diri understands these are Tebrau in Johor, built by New Zealanders from Number 1 Aerodrome Construction Squadron, and Paya Lebar landing ground. The latter was developed in the 1950s as Paya Lebar Airport, which opened in 1955. 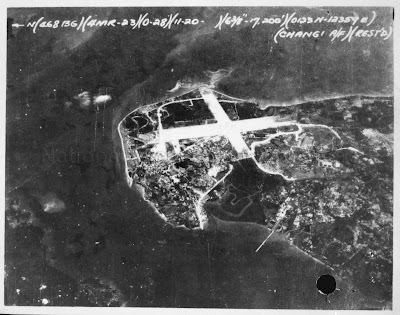 The landing strip at Changi (above), built by POW labour during the Japanese Occupation, evolved into RAF Changi after the war. It was handed over to the Singapore Air Defence Command after the British withdrawal and renamed Changi Air Base. The site was redeveloped into today's Changi Airport following the relocation of RSAF assets to Paya Lebar Airport, when was transformed into a military airbase and renamed Paya Lebar Air Base. Nearly a century after the British military study of Singapore, the approach to protecting airpower on Singapore by maximising landing strips and by fielding strong fighter/anti-aircraft defences remains essentially unchanged. Attempts at making runways inoperable will be frustrated by the RSAF's integrated ground-based air defence network, which has a missile density unmatched in Southeast Asia to counter aerial threats flying at very low level to medium altitude. These armaments can be complemented by sea-based air defences, principally the Aster missile batteries on Republic of Singapore Navy Formidable-class stealth frigates deployed as an advance air defence screen. In addition, the RSAF Air Power Generation Command (APGC) has raised, trained and sustained squadrons adept at executing rapid runway repairs, day or night, even on terrain seeded with area denial munitions such as mines or UXBs. Tube artillery shells and unguided rocket artillery munitions do not have the accuracy required to knock out a runway. This means more guns are needed for every runway targeted, which in turn makes enemy artillery a bigger, more vulnerable target. An adversary with a modest artillery force may have to prioritise its targets, which robs the adversary of the ability to counter all RSAF air bases at the same time. In coming years, one can expect to see substantial redevelopments to the additional land allocated to Tengah Air Base. The runway at Murai Camp, which is now home to the air force’s drone squadrons and has its own runway, is likely to go along with the 2,500m long, six-lane wide Lim Chu Kang Road. A second runway and new taxiways are likely to be constructed on the acquired land, along with hardened shelters to house RSAF warplanes. Bear in mind that when the British operated Tengah, the air base had three runways that criss-crossed one another. 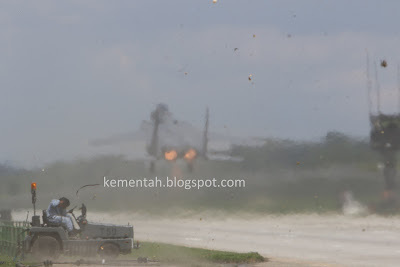 A second runway and new taxiways (which can also serve as alternate runways) at Tengah means the RSAF would be net positive, even with the loss of PLAB and its two taxiways. The RSAF previously operated from Changi Airport’s Runway 3, which is now closed to facilitate construction of Terminal 5. The addition of a future military runway at Changi, without additional airstrips (new runway plus tacxiways) at Tengah, means the RSAF’s runway balance sheet would be net negative as the PLAB runways would not have been replaced. MINDEF/SAF has indicated it will avoid such a situation with the latest land acquisition. Note: As a member of the Advisory Council on Community Relations in Defence (ACCORD) Main Council and ACCORD Educational Institutions council, the writer was briefed by RSAF APGC on Exercise Torrent VII and witnessed the exercise unfold. The writer has attended five of the seven war games in the Torrent series. As a military and history enthusiast, I'm fascinated by the WW2 angle (as i am with your insightful points on the current context). Can i ask about the sources of those aerial photos? From WO files in PRO/TNA in Kew? What about the Pulau Sudong runway. Can shed light on its history and purpose? Big thanks for your article.You mentioned the Tebrau in Johor, built by New Zealanders from Number 1 Aerodrome Construction Squadron. The info is available online at an NZ uni website. View the aerodrome at Taman Mount Austin,Taman JP Perdana and Taman Setia Indah. That was how big the aerodrome was.Quite a long landing strip. RNZAF Number 26 Bomber Group. The present Taman Mount Austin was the concentration camp for high valued anti Japanese resistance fighters in transit to Japan. Whereas Taman JP Perdana and Taman Setia Indah were the runway and parking bay for the Jap bombers or transport planes. @James. Yes the images were taken by the RAF. @Kam Chit Choi. Thank you for the insight into Tebrau. The airfield was bombed by American B-29s towards the end of WW2.